My desire to find French street in Istanbul started when I read an article that described it as French influence in Turkey. The equivalent of China town in New York. I imagined a chance to experience two cultures within one destination. My interest had spiked. The nearest insight I have gained of France was passing through on a coach ride to and from Germany, so I placed French street on my list of things to do. However once I arrived in Istanbul, it soon dawned on me that this street was not the famous and continental image that I had conjured up in my head. Speaking to locals, no one seemed to know where it was. I am sure they were thinking, “Daft cow – this is Turkey, not France”. The conversation started going places when I mentioned the proper Turkish name of the street – Cezayir Sokak. The locals still shrugged their shoulders though. “It is somewhere to eat, drink and be happy,” they said. No indication of why it was different from any other places in Istanbul. We eventually found it on the back streets leading off Istikal Avenue. A narrow and steep passage way dominated on both sides with high buildings. As we walked down, Turkish waiters immediately rushed out to request our presence in their establishments. We chose somewhere to eat and drink, but the menu arrived, and it listed the same old dishes that appear everywhere else. I looked at the buildings but nothing seemed unique and out of the ordinary. 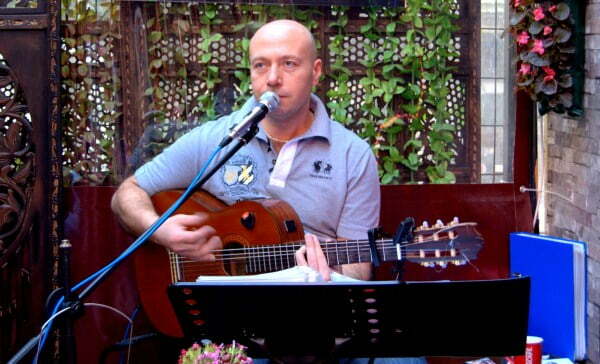 Even the live singer was nothing different, although he was very good at his job. I had to ask the waiter why it was called French street. Ok, the pink cushions and bright canopies made for lovely décor, even though it was a bit garish in my opinion. A couple of restaurants had French names, however nothing else gave me the feeling of France. The waiter, like everyone else, just shrugged his shoulders and could not enlighten me why. Upon my return, I felt massively deceived but had to discover why the street achieved its nickname. Apparently, it is all down to the bare design. In 2004, the street was renovated with the help of Parisian architects. The stones of the street were laid according to their instructions, and the coal gas lamps were imported from France. They made a couple of other tweaks here and there and hey presto, we have a French street in Istanbul! Go there if you want a nice night out in professional establishments. Other than that, do not expect anything more. 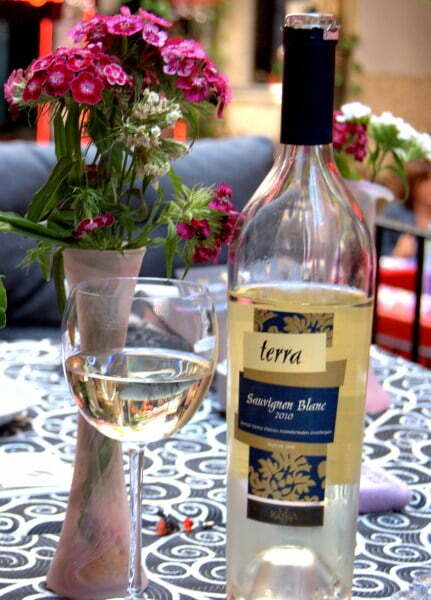 We received good service and delicious food in comfortable surroundings, which softened the disappointment. 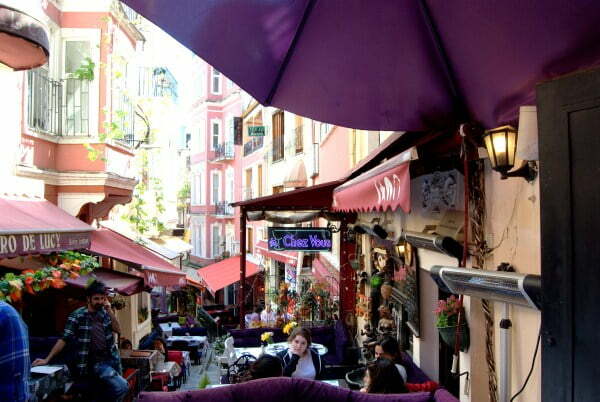 French street is Turkish restaurants, manned by Turkish waiters, who are obsessed with decorating their establishments in bright purple, pink and red colors. Readers question: Have you been to French Street and do you agree with me? Have you been to other places whose reputation is misleading? How strange! No wonder the atmosphere feels all weird! The irony is that Cezayir is the Turkish name for Algeria. So technically it’s called Algerian street rather than French street. Perhaps that would have eased your disappointment. It’s true what they say about Istanbul then, that is such a cosmopolitan city in this case with a French street without French food, I’d be disappointed too! I’ve heard so many great things about Istanbul recently and this street looks gorgeous. I really must get there soon! Those of you who are disappointed about the French street, go to France then. Just because it is called French street, does not mean everything has to be French about it. I live in Washington Ave, and it does not look like Washington at all. You guys are missing the point. It is not about the name. It is about the way the locals present it. It might not be exactly up to your expectations, but DO show some appreciation instead of showing contempt. I would definitely be disappointed if I read “a taste of France” and then found what you did. Especially if I worked my taste buds up to a chocolate eclair and discovered there were none! :) Thanks for the update also…. 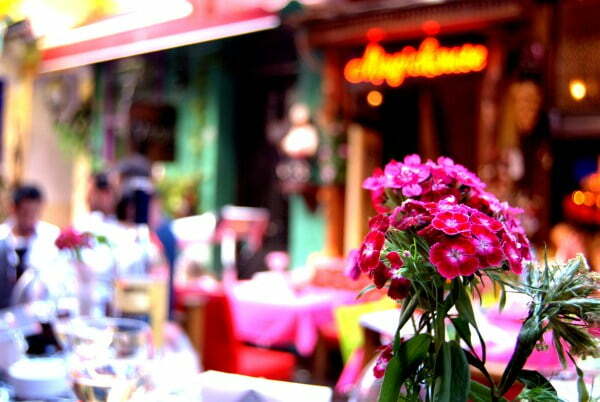 Laetitia – I have always wanted to dine out in a famous street in Paris. Please don’t say they are boring! Glad to see you liked Ceziyor street though. 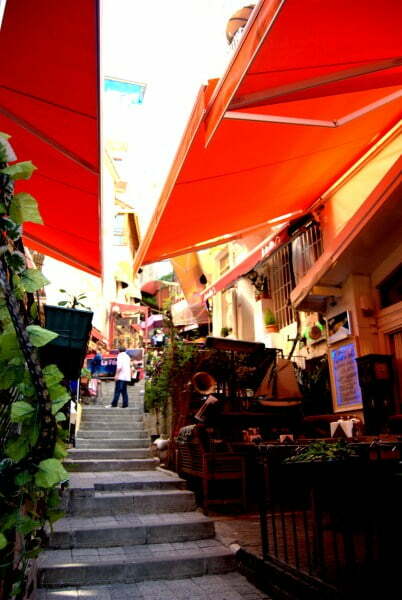 Cezayir street is a wonderful street! So cosy and girly, and lively! 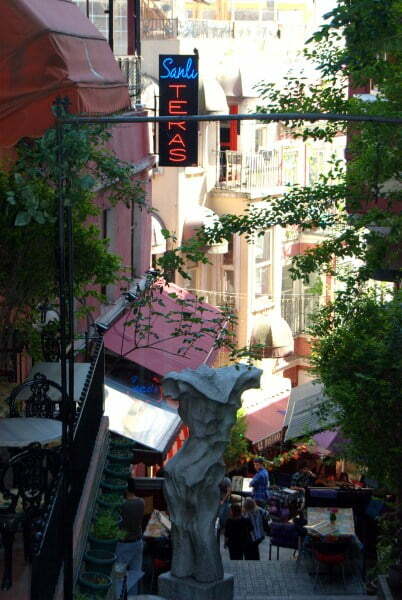 I’m French and never read about it being a “French street” : I found it by chance, and believe me I fell in love with its unique charm and atmosphere in Istanbul. In fact I saved its name to come back with a charming lover sometime. So guys, I’m sorry if you wanted French food or wine, but u know, I’m French and I found it much more interesting than any “deja vu” boring famous streets in Paris: much more authentic, lively and romantic!!! Forget about cliches, it s not worth it and reality is always different than the image of it. At least I can say that I have been there and done it Mary!! Sorry to read about your disappointing experience with French Street. That’s funny. What a field trip! I’m glad you persevered and got to the bottom of it! Looks like a cool street, even if the food is not French. 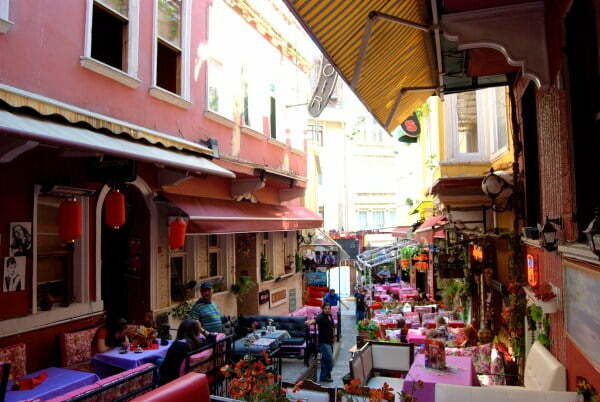 I suppose Cezayir was an interesting, almost secret, little side street hidden away from the main drag of Istiklal. It was fun to see but nothing to get too excited about and it certainly is not reminiscent of France. There are lots of little restaurants packed into this tiny street, though I cannot speak to the quality of food. We went to the rooftop of one of the restaurants (only ordered drinks, nothing spectacular) for a decent view of Sultanahmet and Galata Tower. Overall, this street was a bit too gaudy for my taste (and I love pink!). I don’t remember hearing about that, but I probably wouldn’t have been too interested anyway. 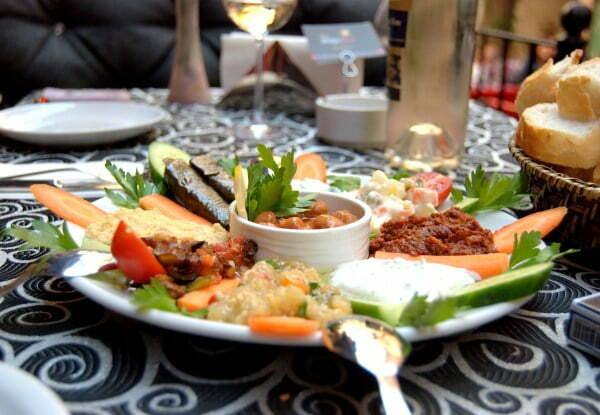 I’m not a big fan of French food, and Turkish food is so good, that’s all I wanted while we were there. How far along Istikal is that street? We walked the length a few times and I don’t remember any street that had places like that. That whole area was pretty neat though. Wish it wasn’t quite so steep in places though. Our hotel was down toward the water amidst the antique shops so we must have walked by it atleast once. Exactly Christy – I was looking forward to some French croissants! Hi Ozlem, I don’t remember seeing any antique stores in French street but there were lots in the other back streets of Istikal avenue. Glad you like the photos. What, no French food on French Street??! False advertising, for sure! Craving every little glimpse of home, I did enjoy your photos!! I am with you about the fakeness of the French bit, though I remember they had some neat antique stores ? Do they still have those shops? hope so! thanks for a lovely dose of home! Ew Sophie – too much pink going off there!! Yeah, definitely a little disappointing and deceiving considering what you had heard about it. I will say it does look French from the photos. Seems that is about the extent of it though. Too bad it turned out to be a disappointing experience. Looks really pretty! So pink, anyone would think we were in a cup cake parlour! . . often seems to be the case that ‘promotional’ sites don’t actually visit the places, glean a few annecdotes, a picture from somewhwere else and ‘Hey Presto!’ they have a review. That said, a good post from someone who has (been there, that is). Very pink. Wear extra strong sunglasses!